The Print Council of Australia Inc. (PCA) is a national not-for-profit member organisation that promotes contemporary Australian printmaking, including artist books, zines, and works on paper. The PCA has a Committee of Management drawn from all state of Australia, and a part-time staff of four complemented by a team of volunteers. 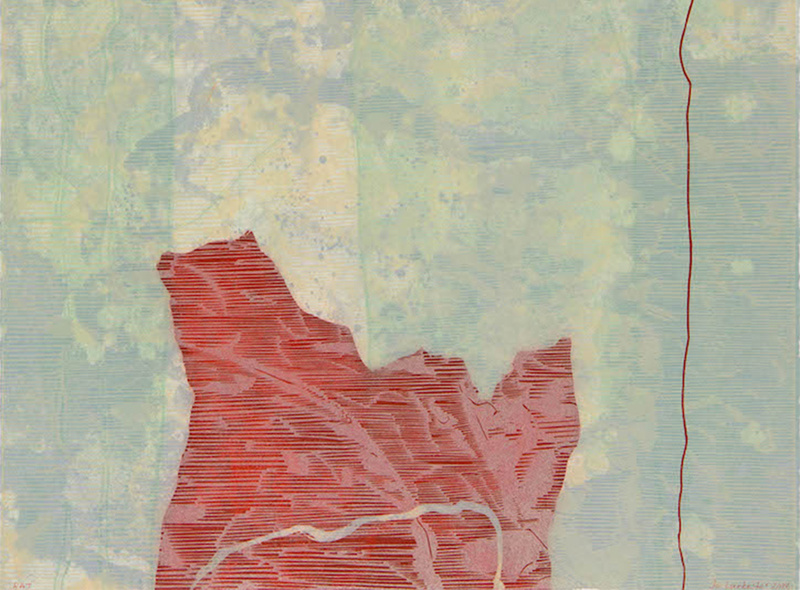 Through the quarterly journal Imprint, the annual Print Commission program, exhibitions and other events the PCA supports the work of its member printmakers and promotes excellence and innovation in the field. 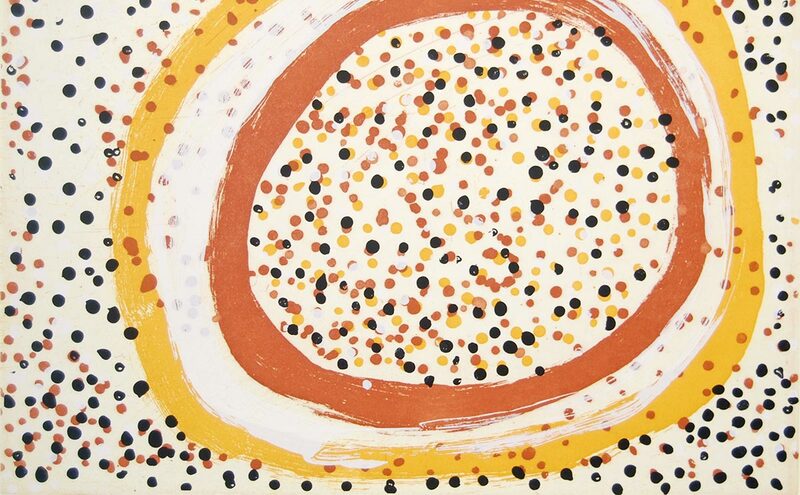 The Print Council of Australia was established in 1966 through the efforts of Dr. Ursula Hoff, who was then Curator of the Prints and Drawings department at the National Gallery of Victoria, and printmakers and educators Grahame King and Udo Sellbach. It’s mission was to encourage the production and appreciation of original hand-printed graphics in Australia, to stimulate printmaking activities, and to encourage the understanding and appreciation of the original print. Today the term print is understood as a multi-faceted medium, with applications in areas including the fine arts, artist books, zines and street art. The type of original prints that the founders of the PCA were seeking to advocate for was set out by Udo Sellbach in the first issue of the Print Council’s quarterly art journal Imprint, Vol 1, No. 1, 1966. The artist alone has made the image in or upon the plate, stone or wood-block or other material for the purpose of creating a work of art. The impression is made directly from that original material by the artist or pursuant to his directions. The organisation held its first annual general meeting in the Print Room of the NGV in November 1966, and Dr Hoff was the PCA’s first president. 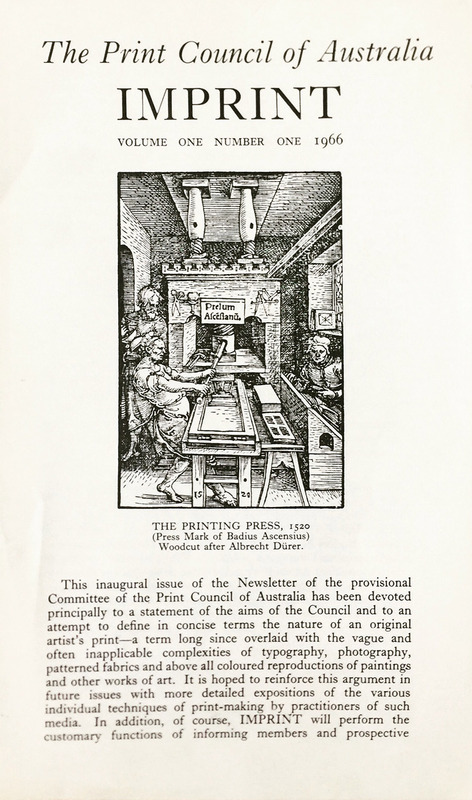 The Print Council was established as, and remains to this day, a non-profit membership organisation, with an open membership policy. As such the PCA’s membership consists largely of practitioners, but also curators, writers, collectors and students, along with institutions, schools and public and private galleries. Over the past half century the organisation has played an important part in nurturing a unique art world ecology centred upon the graphic arts. Two of the major vehicles that do this were established from the outset, and are still fundamental to the core activities of the Print Council of Australia. The first is the quarterly art journal Imprint, which began as a black and white pamphlet, printed at A4 size and folded down the middle. 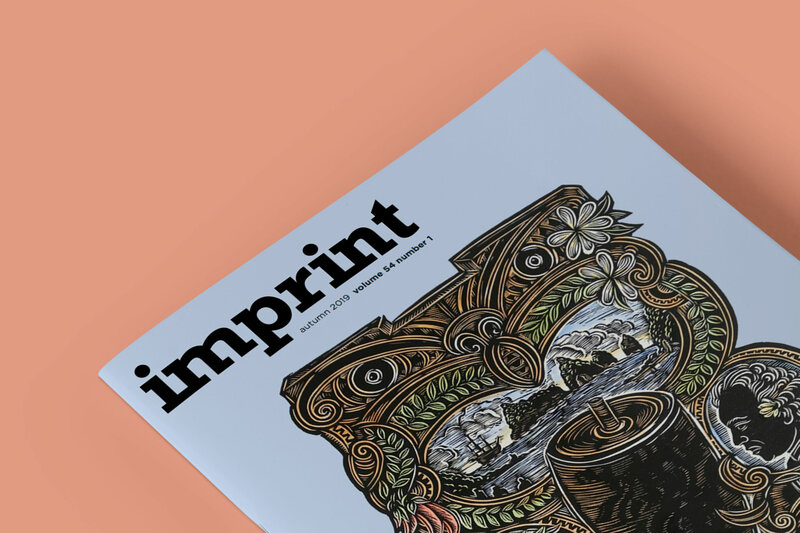 Today Imprint is a multi-page colour journal, the only of its kind in Australia and one of just a handful worldwide dedicated to contemporary printmaking. While the size of the magazine has developed, the fundamental purpose of Imprint has remained largely unchanged over its long history, which is, to engage in meaningful and diverse debate and analysis surrounding contemporary printmaking within a broader fine art context, while nurturing the development of new and diverse voices, alongside those more established in the field. The second major program that the PCA established very early on is the annual Print Commission. A year after its foundation, the PCA began the annual program of inviting artists to create new original print editions, in order to foster the creation of new work in print media and promote the development of Australian printmaking, while raising funds for the organisation to operate. The first member print (as they were then called) created for the PCA was a monochromatic lithograph by John Brack, untitled and printed in an edition of 200. Prints have been commissioned annually since 1967, with an impression of each retained in the PCA Print Archive. This has grown into a collection of national significance. Today the Print Council of Australia continues to produce Imprint and the PCA Print Commission, along with a host of other projects, exhibitions and member opportunities that advance the appreciation of printmaking as an art-form. Excerpt from the presentation “Paper Tales: Highlights from the Print Council of Australia Collection” by Marguerite Brown, delivered at the Ursula Hoff Institute Annual Reporting Meeting 2017, Melbourne, 26th September 2017.